Our facility contains two separate gyms (large and small) that are used for training tumbling, dance, and our competitive teams. 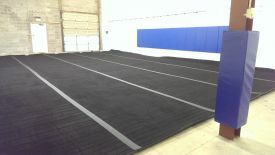 Tumbling and dance classes take place in one or both gyms daily. In the large gym, athletes have access to the Tumbl Trak which is used to assist in safely progressing the skills of our athletes. Schedule a tour and receive a FREE TRIAL CLASS!! !